I saw your ad on Craigslist for the saeco (odea go) espresso machine that you are selling for $650 http://toronto.en.craigslist.ca/tor/hsh/2179825509.html. I just wanted to tell you about this new thing I discovered the other day. It is called Google. People claim it is a "search engine" but I think of it more as a looker-upper. You can type in "Kirk Cameron" for example and it will find you his web page which shows that he is really holding on to the Growing Pains thing, in fact his page plays the theme song from the show automatically (over and over again). You should check it out for yourself http://www.kirkcameron.com/ . But I digress. 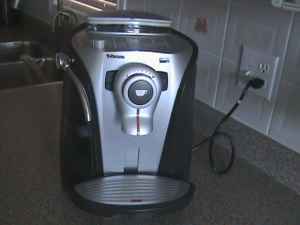 You can also type in "saeco odea go espresso machine" and see that they sell for between $400 and $500 new. So I have two questions for you. 1) Did you know that Kirk is a born again Christian now? 2) Why do you think your used espresso machine is worth so much more than a new one? Kirk Cameron's site is already down. I want a rebate on this FOCL. @T. Bain: I'm sure his site is down due to the overwhelming traffic coming from FOCL.